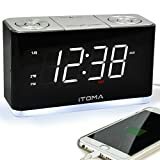 Because cell phones now come equipped with alarm clock functions, many use this technology rather than clocks. 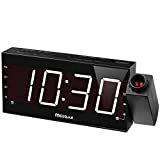 But clocks have distinct advantages which cell phone alarms do not. Alarm clocks are much easier to see, with larger numbers and controls. Many are produced with AM/FM radios, and these allow for musical alarms with much more variety than the standard cell phone choices. 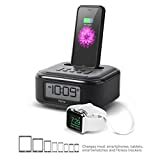 The newest model clock radios also have charging ports, which makes it very easy to find a spot for charging a cell phone, rather than depending on it as an alarm. There is also evidence to suggest that cell phone light can be very bright and interfere with sleep. 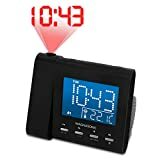 For those who are ready to try out some of the best portable clock radios, here are some popular choices to consider. 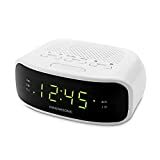 With its AM and FM radio, this digital alarm clock allows for recurring alarms customized for daily wake-up times throughout the week. There is also a sleep timer with settings ranging from 15 to 120-minutes duration. It has a white case and red easy read numbers on a warm toned display plus an adjustable backlight. There are 5 presets for the AM channels and 5 for the FM. It has digital tuning, dual alarm tuning, plus snooze and nap timers. It also includes a 3.5 mm auxiliary input for most audio devices for easy listening through the radio. It also has a permanent energy storage device which allows it to keep time for temporary power shortages. There is a 40-inch long wire antenna included connected inside the case. Many customers like the RCR-5 back-lit LCD display due to its adjustable intensity. Most appreciate the excellent quality of the radio reception, noting that it is clear and distinct. This product is viewed by most owners as a quality item. This Model T236BQX FM radio and clock offers several nice features. The two alarms can be used independently and set to different times. Wake up is with a buzzer or the FM radio. The display is a bright green or red LED, which are both easy to see at 1.2 inches. The radio frequency and time are both shown. There is a memory feature which allows for setting the 10 available stations. It also includes a USB port, which makes it handy for charging various mobile devices. 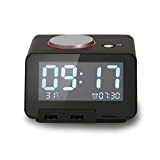 Redi-Set feature allows users to indicate the correct time zone and the clock sets itself to the proper time, day, date, month and year automatically. Most owners like its compact size and good radio reception. A few wish that it was a bit easier to use, but discover that practicing solves initial user issues. 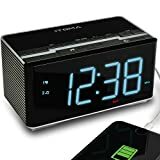 For the technology challenged or advanced, there is a clock radio which will be suitable. The key is to compare the various features and functions because the brands can seem very similar. Usually, there will be one feature which will be particularly liked or disliked. Using that as a starting point is a good idea. Comparing the features comes next. Thinking about whether the product will work well in its intended space and considering the overall value of the price are also key issues. There are hundreds of clock radios on the market. These top ten offer some of the most popular features available and can make a world of difference to the frequently difficult process of moving from horizontal to vertical.